PROTECT YOUR BABY'S SENSITIVE EARS FROM IRRITATING LOUD NOISES with the BBTKCARE comfortable and safe baby noise cancelling headphones and make sure that your infant can sleep like an angel even during the loudest outdoor events! YOUR NEWBORN WILL LOVE THE SOFT PADDED DESIGN, since the zero- pressure noise reduction earmuffs will perfectly cover your baby's ears and reduce loud noises to a minimum. Plus, the adjustable and comfy headband will ensure a perfect fit. PERFECT FOR NAP-TIME ON THE GO! 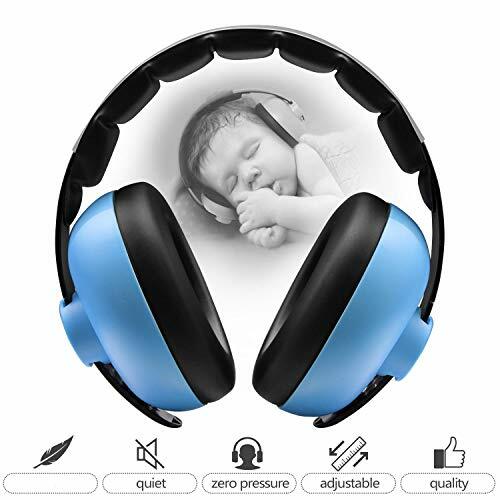 The BBTKCARE baby noise cancellation headphones are ideal for concerts, football games, cinemas, theme parks, outdoor events, firework shows, church or even airplane, train and subway trips! LOOKING FOR THE BEST BABY SHOWER GIFT? Offer new mommy our baby headphones and help their infant sleep without worrying about disturbing loud noises. And they can carry the headphones everywhere due to their compact design. 100% HAPPY SLEEPING BABIES OR YOUR MONEY BACK! That's our unconditional satisfaction guarantee. Your baby can try the BBTKCARE infant sound cancelling headphones for 90 days and if you're not 100% thrilled, we'll offer you a full refund!